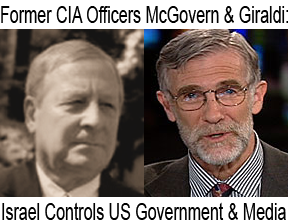 First half-hour: Former CIA officer Philip Giraldi recently pointed out that “The Lobby Is International”. A few days later The (international) Lobby suffered a huge defeat as the P5+1 powers reached a preliminary agreement on Iran’s nuclear energy program. Is this the beginning of the end of Israel’s death grip on US foreign policy? Or will The Lobby use its massive influence in Congress to wreck peace with Iran…and once again trick the US into fighting a war for Israel? Philip Giraldi is a contributing editor to The American Conservative and executive director of the Council for the National Interest. The ballots for voting on Veterans For Peace’s 2013 National Resolutions are due to be submitted to VFP’s national office this coming Friday, November 29th. The one resolution that could determine if the antiwar left makes a public call for impeaching Obama for war crimes is our VFP Resolution 2013, which would force VFP’s national president Patrick McCann to issue and make public as a download on the VFP national website an official letter to each member of Congress directing them to immediately begin impeachment proceedings against democrat President Obama for the same war crimes and then some that were cited in the antiwar left’s very public calls for impeaching the republican President Bush. Please note that VFP’s national president and chair of the VFP national board of directors, Patrick McCann, has been sending out emails telling all the VFP chapter contacts to vote against the resolution 2013-10 which would force him as VFP’s national president to issue the official VFP letter to all members of Congress directing them to immediately begin impeachment proceedings against Obama for war crimes. The impeachment resolution passed at the 2011 VFP national convention and VFP’s national leadership has squashed and suppressed it ever since. Please also note that it will most likely be the same VFP national leadership and national president Patrick McCann who will be overseeing the counting of the mail-in ballots due to be mailed in by VFP members across the country by Nov 29th. Let us not forget, that as long as a public call for impeachment is partisan … as it was with the antiwar left calling for impeaching the republican Junior Bush … it will rarely succeed in having the desired effect. However, if the public call for impeachment is non-partisan, and even better from the president’s own party/base/team … then it is a very dangerous thing that could provide significant pressure towards achieving the desired effect, such as stopping the damn wars! Perhaps that is why there has been so much effort on the part of the mis-leadership of VFP and the other national antiwar organizations to suppress the rank and file calls for impeachment of the democrat Obama. People need to know what’s going on at VFP’s national leadership and especially what the current VFP president Patrick McCann (will he be overseeing the counting of the votes submitted by VFP’s membership?) is up to! This entry was posted on Monday, November 25th, 2013 at 9:08 pm	and is filed under 9/11, Anti-War, False Flag/Fake Terror, Freedom, Justice, Kevin Barrett, News, Protest, War Crimes. You can follow any responses to this entry through the RSS 2.0 feed.